Indigenous peoples leaders discuss their agenda before Filipino journalists in Manila. The agenda will be handed to President Benigno Aquino in a meeting in the coming days. 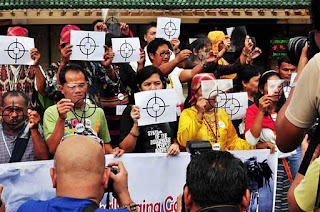 And tribesmen and advocates hold a symbolic crosshair targets to protest the continued extra-judicial killings of indigenous natives in the country. MANILA (Mindanao Examiner / Oct. 24, 2011) – Philippine tribesmen gathered Monday at public plaza in Quezon City to demand immediate legislative and executive action to address peace, justice and development issues faced by indigenous peoples communities in the country. 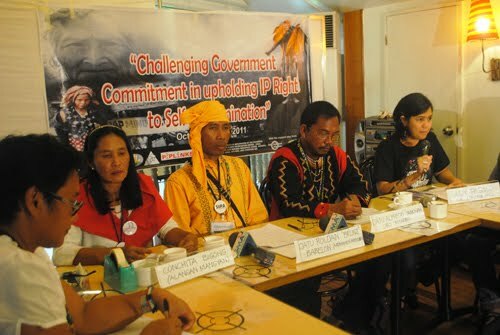 “We are here to present to the concerned government agencies, especially to the Office of President Aquino, our common agenda as indigenous peoples,” said tribe leader Datu Roldan Babelon, who came from Mindanao. They will spend the whole last week of October – in line with the commemoration of the Indigenous Peoples Month - visiting different government agencies, including Congress, Senate and Office of the President to present their 10-point agenda crafted during the State of the Indigenous Peoples Address conference in Koronadal City in July. They also held a meeting with House of Representatives Deputy Speaker Erin Tanada and sought his support for the passage of the Anti-Racial Discrimination Law; the review of the implementation of the Indigenous Peoples rights Act, specially the Free, Prior Informed Consent, the issue of mandatory representation of indigenous peoples in local government councils, among others.